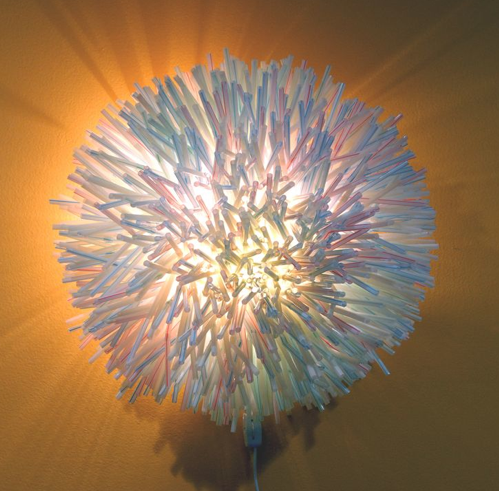 Mark Montano: Starburst Straw Lamp.....WOW! It's very late and I'm trying to decide on which project to write about next. As I look up on my studio wall I notice my "Strawburst Lamp" and realize that I haven't turned on this lamp in quite a while. All of a sudden it hits me that this lamp totally encompasses everything I love about being creative...about my creative.....I take the mundane and make it insane. I really love the way this lamp looks when every other light in my house is off. Step 1: Bend your straw in half and poke it through the inside of the deep-fryer so that the bend in the straw wraps around a wire. Step 2: Continue this process until your entire deep fryer is filled with straws and then bend the handle toward the inside. Step 3: Attach your socket and bulb inside the handle so that it's secure. The bulb should be big enough to be wedged inside the loop of the handle so that it doesn't move and does not touch the straws. Step 4: Hand this baby on a nail on the wall and plug it in. You've just made a deep-fryer and some drinking straws into something everyone will comment about when they enter your abode. Send me photos of how yours turns out. I would love to see how you make this project.